We caught up with the lovely illustrator, Creative Director and blogger, Kelly Thompson to chat about her creative process and garnering a reputation as one of New Zealand's most internationally recognised illustrators. Did you expect a career in illustration to take you this far? I knew that I wanted it to go somewhere, but I never really realised exactly what you could do as an illustrator and the opportunities there could be. I definitely didn't expect that it would grow to me having my own agency and working as an art director. Some of my most memorable experiences would be winning the Escada pitch, speaking at Semi-Permanent numerous times. Taking the plunge to stop drawing all the time and launch my own agency, UNA was a pretty exciting step, I'm sure it will become memorable! What’s your typical design process? First, I ask as many questions as I can of the client, figure out what they actually want, ask for examples of things they like, show them things to figure out where their head is at. The most important things are to make sure you're on the same page at the start. Then I do research followed by super rough (and kind of terrible) sketches which I occasionally share on Snapchat so people can see how basic they really need to be. I always accompany these with references of my work so people can visualise what they are going to get. From there I revise the sketch if adjustments are needed, or I go on to tidy line work. Once done I resubmit, make adjusts or move to colour which I do digitally. Then Ta da! For art direction and consulting the process is a bit more varied and longer. I always meet clients in person or we have skype meetings, there is much more researching, clarifying requirements, mood boards, sourcing of creatives, creative management. It's a bigger process, but I love it. What has been your most exciting collaboration so far? I did a really fun event for Maybelline NY NZ a couple of years ago that involved me creating a face chart then flying to NZ and hosting a press day where I ran through the new season products and taught an art class with makeup, I really enjoyed using my skills in a completely different way. Recently with UNA we were commissioned to do the Formula E worldwide racing campaign, a project that ran for almost a year and was seen on LED billboards the size of football fields and all sorts of amazing media around the world, that was extremely exciting because it was just such a huge scale project! What are your favourite pieces for our latest RUBY & Liam Winter collections? I've been wearing the Galaxy Turtleneck a lot! I really like how it's a little bit 70's with the golden sparkle as I'm going through a huge disco/70s moment right now. I love the velvet Bunny styles, the velvet Vampire Choker and the red Alpine Peacoat, it's such a good colour for dull grey winter days. When it comes to winter we're all about comfort food. So when Olivia from The Raw Kitchen came out with her new book, The Raw Kitchen, full of delicious, wholesome & nutrient rich recipes, we knew we'd be content hunkering down for the cooler season with a repertoire of scrumptious meals. We've got one copy of The Raw Kitchen cookbook to giveaway to one lucky RUBY girl. Head to our RUBY Instagram to find out how you could go in to the draw to win. The winner will be announced on Monday 13th June at 2pm NZT. Olivia has also created a brand new recipe exclusively for us to share with you. Enjoy! Line a 28cm torte pan, or 22cm cake tin with baking paper and set aside. Place rhubarb for the garnish onto a dehydrator tray and leave for 45 minutes at 48 degrees Celsius. Set aside. For the base, place coconut, sunflower seeds & raw cacao powder in a food processor and blend until well mixed. Add coconut oil and sea salt, and blend until smooth. Be careful the mixture does not overheat. Finally, add the dates and blend until smooth. Press into the torte case or cake pan, and ensure edges are smooth by using the back of a spoon. Place base aside. For the filling, blend cashews, water and strawberry until smooth. Add coconut oil, sweetener, vanilla bean, sea salt and blend further until smooth. Finally, add psyllium husk and blend. Quickly pour mixture onto base and flatten with the back of the spoon. 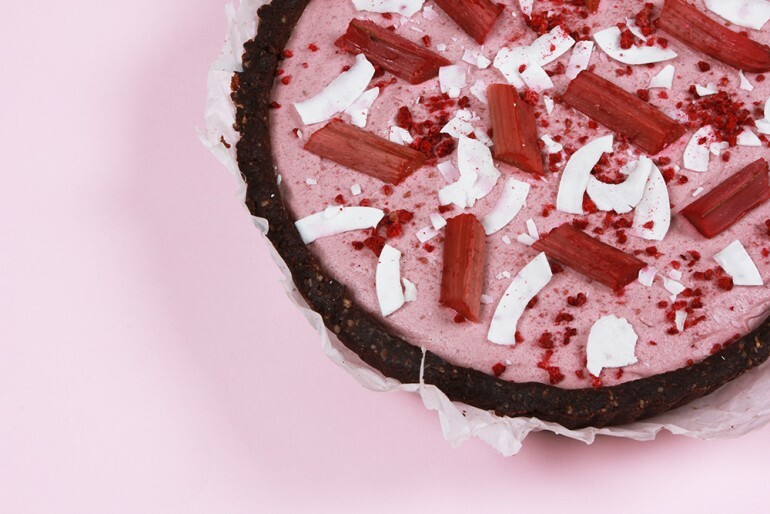 Garnish with chopped rhubarb, coconut chips and freeze-dried raspberries. When ready to serve, take your Strawberry, Rhubarb & Coconut Torte out of the freezer and leave to sit for 1 hour. Enjoy with a dollop of coconut yoghurt or fresh fruit. Your cake will last for 1 week in the fridge or up to 3 months in the freezer. 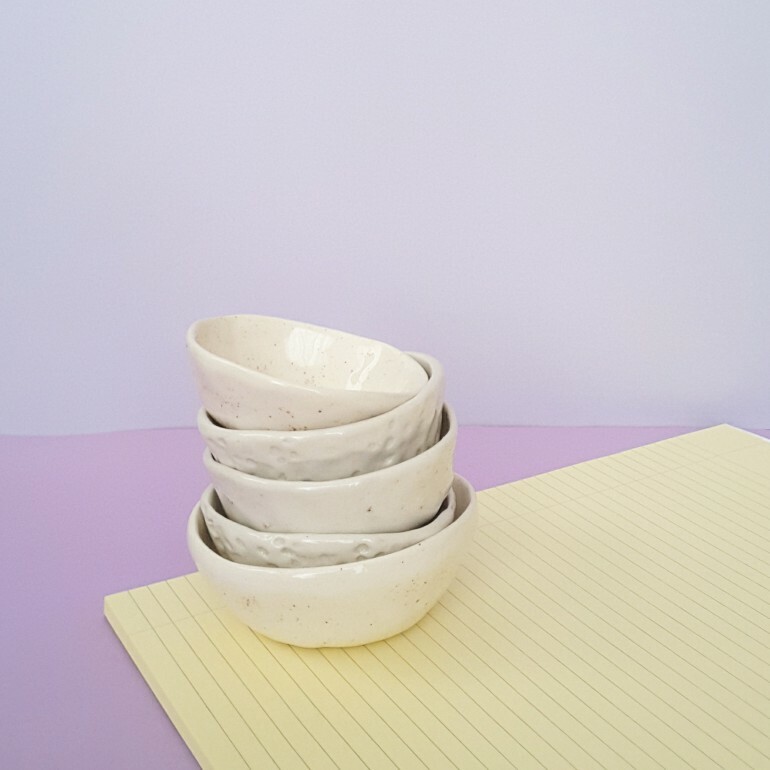 Ceramics artist Felicity Donaldson works in a sun-beaten studio where she designs, handmakes and collaborates to make unique pieces under the name Wundaire. What started out as making pots for houseplants grew into Felicity's full-time career in pottery, with the support and encouragement of friends & strangers worldwide. Unlike many of my friends or people that I have met since starting ceramics, it was not something I did when I was a child or part of the curriculum at school. I was always interested in art and making things; sand saucers and houses for my cat. It's so nice to chat with people who say 'oh my mother / uncle / gran was a potter.' 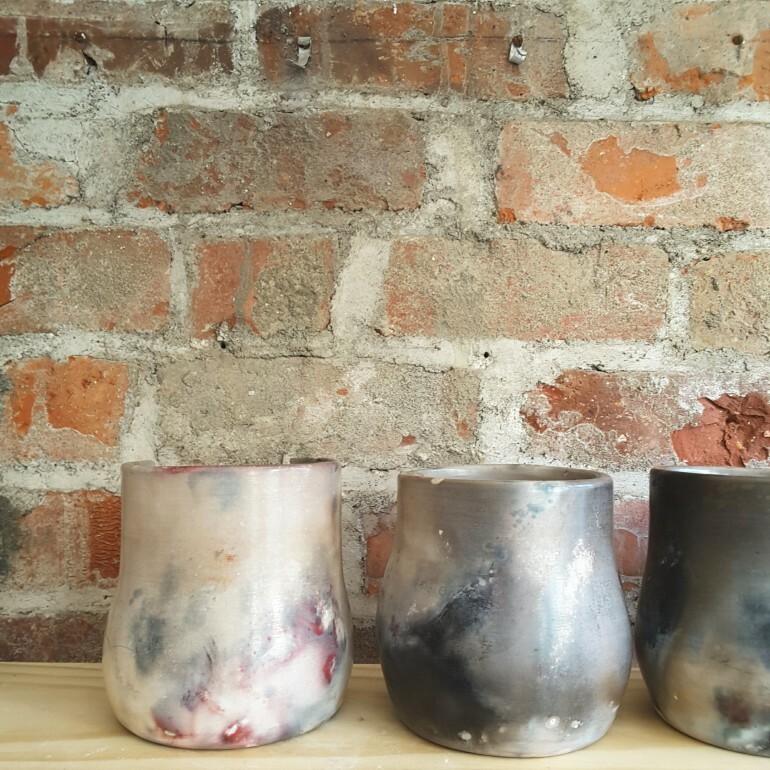 There is a long history of studio potters in NZ. I got into it when I was living in a big spacious apartment on K Rd in Auckland. I love plants and wanted to bring some greenery into a pretty stark urban environment but had a hard time finding pots that I liked to put them in so decided to make my own. I signed up for a 10-week course at Auckland Studio Potters in Onehunga where I learnt a bunch of different techniques from some lovely and very experienced master potters. Working with clay is pretty addictive so I set up a workbench in a corner of my apartment to continue making pieces at home in between the weekly classes and carefully transported them in my car to the community kiln with quite a high loss rate - the work is very fragile in its dry, pre-fired state. These factors, combined with having to move from that apartment, led to my move out to Bethells Beach on the West Coast to a cool little cottage amongst the trees, with a garage where I could house my own kiln. It was such a beautiful, wild creative space. I cut back on my work in the city, spent hours holed up by myself making and practising. Things have really grown from there. 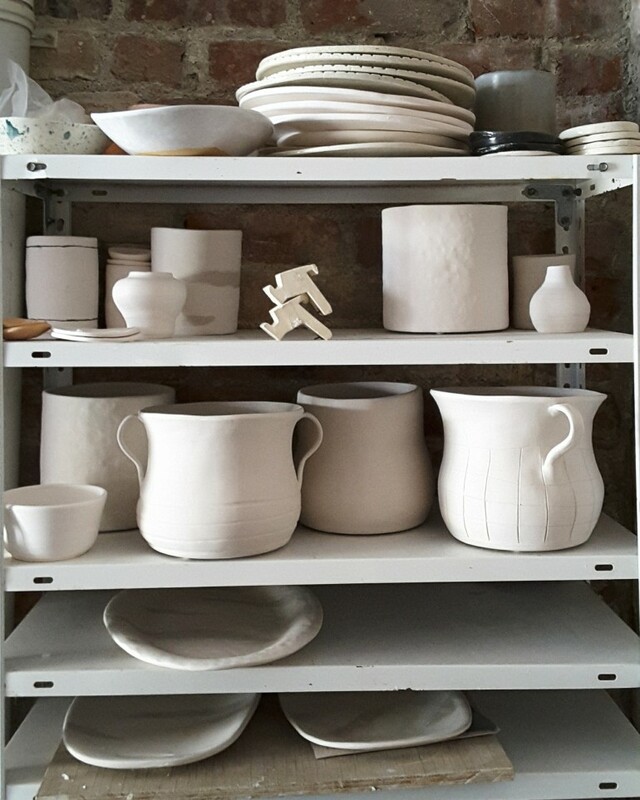 Can you talk us through your process of designing and making ceramics? A lot of trial and error! Working with clay is amazing, to go from one medium that is essentially mud to stone. The process of making each piece, even if it just a little trial to see how the colour is going to turn out, can take two weeks. It's a slow craft that has definitely taught me patience. If you try to rush any step it can ruin the end result. Brutal. I am a bit old school and like to visit the library, taking out (and racking up overdue fines!) books on photography, painting, textiles but I tend to find quite a lot of ideas just slowly evolve. Quite a lot of the commissions I get for restaurants / dinnerware comes from my previous work that people may have seen and liked. I'll take these designs and adapt them to fit the clients' needs by changing the size and finish using different types of clay or glaze. I have spent many years working in hospitality, I love people, great food and wine. I also understand what it's like trying to carry 3/4 plates through a crowded restaurant so I try to incorporate comfort for the staff into my designs. Do you have a favourite piece that you have made so far? My favourite piece would have to be the largest pit fired pot I have made. It has the most beautiful colours on it and gentle lovely curves, it is the piece I am always striving to replicate in my firings, however, the nature of pit firing is fairly unpredictable, which is what I love about it. Each piece is totally unique. Meadowlark Jewellery approached me just before Christmas about making gifts to send to their stockists worldwide. So it was very flattering to be asked and nerve wracking as I wanted to create something that aligned with their strong aesthetic which wasn't cliché or overdone. It pushed me into experimenting with new materials and glazes. I ended up designing a jewellery dish in matte black with shards of glass melted into the surface. 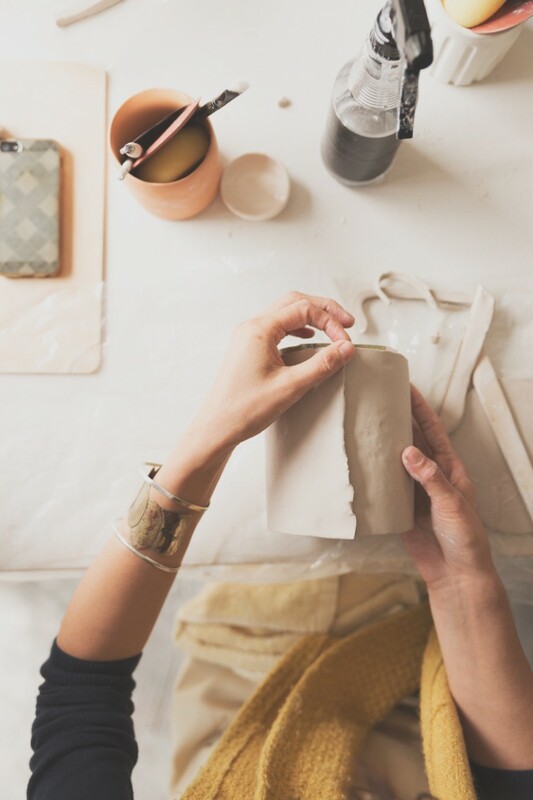 Did you ever expect to make ceramics a profession? I never expected to make ceramics a profession let alone have the amazing opportunities that have arisen over the past two years. Instagram has been key in making connections and launching Wundaire as a brand. It's how I met Unna Burch of The Forest Cantina, who I collaborated with when I lived in Auckland. 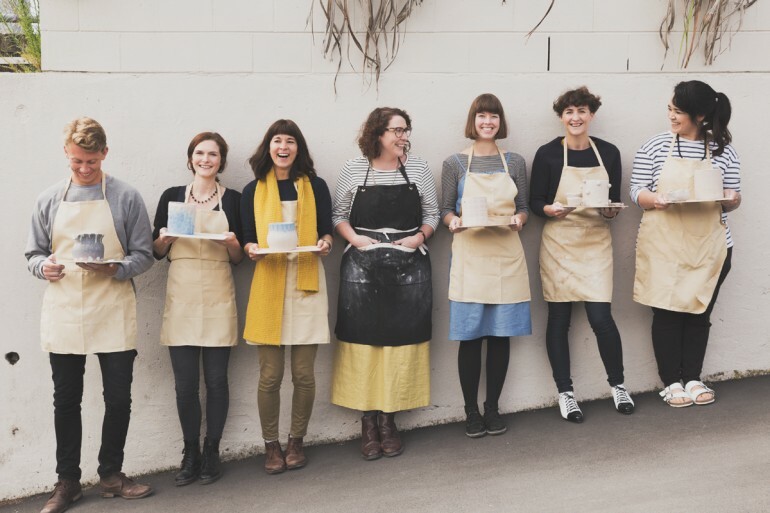 Now I live in Wellington I have met so many other amazing people, particularly awesome business ladies like Mindy Dazell of Twig and Arrow and Eloise Evans who runs the Neighbourhood Studio, a cool screen printing collective. It's a joy to be part of such an incredibly supportive creative community here in Wellington. People tell you it will all come together, all the jobs you work and life experiences you have. It's hard to believe sometimes when you are in the middle of it all thinking, what the heck am I doing with my life? Now I'm in my 30's I am finding it to be true. The hospitality jobs I worked taught me how to relate to people and offer great service. Working in a retail and visual merchandising taught me how to sell, teach and train people. It also taught me to do my own taxes. These are all skills that are key to running my own business. I am probably using my Textile Science degree more than ever now that I am working with chemicals and mixing my own glazes. What can we expect next from Wundaire Ceramics? I am going back to where it all began and focusing on making rad pots for beautiful plants as they really do bring so much joy. 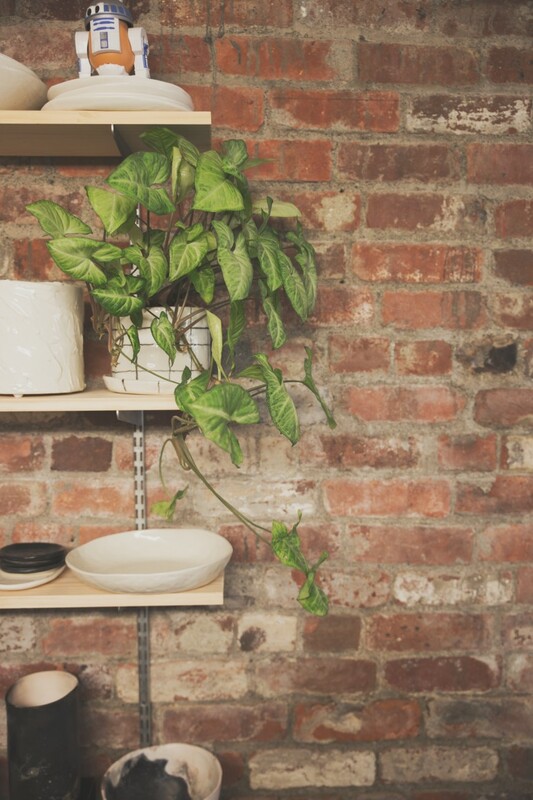 Workshops are starting up at the end of April in my studio in Brooklyn, Wellington where people can come and learn some basic hand building techniques, make something to take home and maybe feel as inspired as I did to carry on making things at their kitchen benches at home late into the night.